economist (1723-1790). Autograph letter signed. Glasgow. 4to. 2½ pp. on bifolium with address on verso. In custom-made cloth box. To the 1st Earl of Shelburne, about the health of his son Thomas, then Smith's student and lodger: "My Lord / I think it my Duty to inform your Lordship that Mr. Fitzmaurice has been for some days past ill of a slight fever, from which, however, he never appeared to be in the least danger and from which I hope he is now in a fair way of recovery. He was seized with it on Wednesday last. I missed him that forenoon from the Class, which I had never done before and upon my return to my own house, I found him lying upon his bed and complaining of a headache. I immediately sent for a Physician who ordered him to be blooded. He was a good deal relieved by the bleeding, but became very feverish that evening. He continued so all next day but the day following found himself greatly relieved in consequence of a sweat and a sound Sleep. I should have written to your Lordship that evening, that is by fridays post, for I could have written no sooner, but he appeared to be so much better and Dr. Black assured me positively that all danger was now over, and that he would probably be quite well next day, that I resolved to wait one other post before I wrote anything that could possibly alarm your Lordship [...] Your Lordship, perhaps, may think that as I ventured to delay writing to you by last post, I ought not to have written by this: and I shall readily acknowledge that my behaviour in this respect is not very consistent. But when Mr. Fitzmaurice had a slight relapse on Saturday evening I felt so much uneasiness for not having written to your Lordship the day before that I resolved never to expose myself to the like; your Lordship my depend upon his being treated with the utmost care and attention [...]". 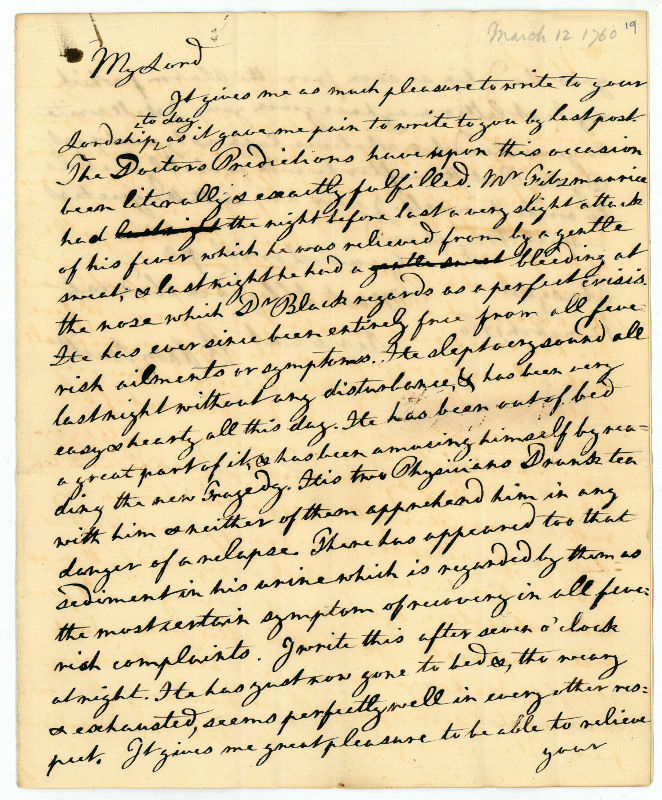 Written in ink in a neat cursive hand, approximately 23 lines to the page, with a few corrections and one or two smudges not affecting legibility in the text, annotated: "Mr. Smith giving acct. of my son Thomas his illness & recovery". Sometime folded for posting, short tear at the foot along fold, verso with docket lightly dust soiled. Adam Smith was appointed professor of logic, and then of moral philosophy at Glasgow in 1751 and 1752 respectively. As a professor, Smith took students into his house, offering both supervision in studies and board and lodging. Of these students, the names of only two have come down to us: Henry Herbert, later Lord Porchester, and Thomas Petty-Fitzmaurice. In 1758 Gilbert Elliot, later Lord Minto, recommended Glasgow University rather than Oxford for the education of the younger son of the 1st Earl of Shelburne (the maternal grandson of the economist William Petty). Petty-Fitzmaurice (1742-93) had earlier been educated at Eton. For two years from 1759, Thomas Petty-Fitzmaurice lived with Adam Smith. After Glasgow he went to St Mary's Hall, Oxford, in 1761, was called to the English Bar in 1768 and became a Member of Parliament in 1762. In 1779 he set up as a linen merchant and established a bleaching factory at Llewenny in Wales, as his Irish estates were unproductive. He was reported to have lived on “the most intimate terms with Johnson, Hawkesworth and Garrick”. 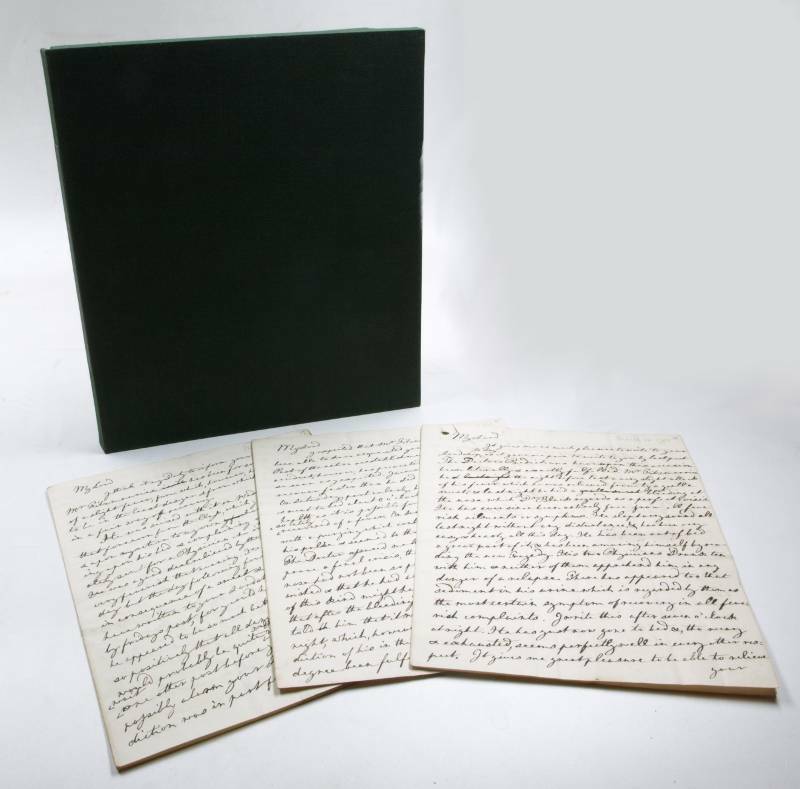 - The total number of recorded letters written by Adam Smith is surprisingly small - about 200, of which at least 24 are only known from published sources, which leaves about 176 letters surviving, virtually all in public collections. There are only 11 surviving letters of Adam Smith's predating his correspondence with Lord Shelburne. - Provenance: Bowood, home of the Earls of Shelburne..
economist (1723-1790). Autograph letter signed. Glasgow. 4to. 1½ pp. on bifolium with address on verso. To the 1st Earl of Shelburne, regarding the health of his son Thomas, then Smith's student and lodger: "My Lord / It gives me as much pleasure to write to your Lordship today as it gave me pain to write to you by last post. The Doctors Predictions have upon this occasion been literally and exactly fulfilled. Mr. Fitzmaurice had the inght before last a very slight attack of his fever which he was relieved from by a gentle sweat; and last night he had a bleeding at the nose which Dr. Black regards as a perfect crisis. He has since been entirely free from all feverish ailments or symptoms [...]". 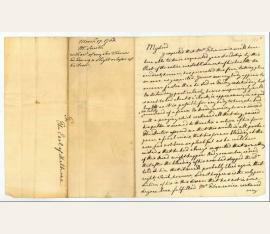 Written in ink in a neat cursive hand, approximately 23 lines to the page, with a few corrections in the text, addressed on the verso of the second sheet, annotated: "Mr. Smith concerning my son Thomas’s health". Sometime folded for posting, some light soiling along the folds. - Adam Smith was appointed professor of logic, and then of moral philosophy at Glasgow in 1751 and 1752 respectively. As a professor, Smith took students into his house, offering both supervision in studies and board and lodging. Of these students, the names of only two have come down to us: Henry Herbert, later Lord Porchester, and Thomas Petty-Fitzmaurice. In 1758 Gilbert Elliot, later Lord Minto, recommended Glasgow University rather than Oxford for the education of the younger son of the 1st Earl of Shelburne (the maternal grandson of the economist William Petty). Petty-Fitzmaurice (1742-93) had earlier been educated at Eton. For two years from 1759, Thomas Petty-Fitzmaurice lived with Adam Smith. After Glasgow he went to St Mary's Hall, Oxford, in 1761, was called to the English Bar in 1768 and became a Member of Parliament in 1762. In 1779 he set up as a linen merchant and established a bleaching factory at Llewenny in Wales, as his Irish estates were unproductive. He was reported to have lived on “the most intimate terms with Johnson, Hawkesworth and Garrick”. The total number of recorded letters written by Adam Smith is surprisingly small - about 200, of which at least 24 are only known from published sources, which leaves about 176 letters surviving, virtually all in public collections. There are only 11 surviving letters of Adam Smith's predating his correspondence with Lord Shelburne. - Provenance: Bowood, home of the Earls of Shelburne..
Autograph letter signed ("Adam Smith"). To the 1st Earl of Shelburne, regarding the health of his son Thomas, then Smith's student and lodger: "My Lord / I expected that Mr. Fitzmaurice would have been able to have acquainted your Lordship by this post of the entire reestablishment of his health. An accident, however, has prevented this from taking place as soon as I expected. I never saw any body appear to recover faster than he did on Friday and Saturday last. On Saturday, particularly, he was surprisingly well and went to bed about 8 o'clock, in appearance, in as good health as it is possible for anybody to have, who had so lately recovered of a fever. On Sunday morning he was seized with a purging which continued all that day, raised his pulse and seemed to threaten a return of his fever. The Doctor assured me that this would in all probe[bility] prove a final crisis, that his former bleeding at the nose had not been so plentiful as he could have wished and that he had always suspected that something of the kind might happen [...]". Written in ink in a neat cursive hand, approximately 23 lines to a page, with a few corrections in the text, addressed on the verso of the second sheet, annotated: "Mr. Smith with acct. of my son Thomas his having a slight relapse of his fever". Sometime folded for posting, lightly soiled along the folds, short tear at the foot along fold. - Adam Smith was appointed professor of logic, and then of moral philosophy at Glasgow in 1751 and 1752 respectively. As a professor, Smith took students into his house, offering both supervision in studies and board and lodging. Of these students, the names of only two have come down to us: Henry Herbert, later Lord Porchester, and Thomas Petty-Fitzmaurice. In 1758 Gilbert Elliot, later Lord Minto, recommended Glasgow University rather than Oxford for the education of the younger son of the 1st Earl of Shelburne (the maternal grandson of the economist William Petty). Petty-Fitzmaurice (1742-93) had earlier been educated at Eton. For two years from 1759, Thomas Petty-Fitzmaurice lived with Adam Smith. After Glasgow he went to St Mary's Hall, Oxford, in 1761, was called to the English Bar in 1768 and became a Member of Parliament in 1762. In 1779 he set up as a linen merchant and established a bleaching factory at Llewenny in Wales, as his Irish estates were unproductive. He was reported to have lived on “the most intimate terms with Johnson, Hawkesworth and Garrick”. 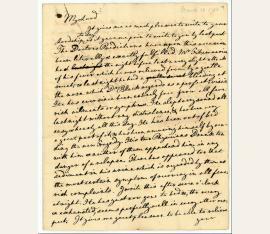 - The total number of recorded letters written by Adam Smith is surprisingly small - about 200, of which at least 24 are only known from published sources, which leaves about 176 letters surviving, virtually all in public collections. 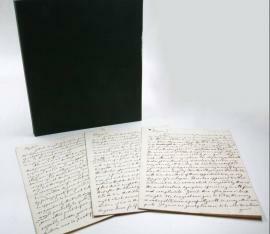 There are only 11 surviving letters of Adam Smith's predating his correspondence with Lord Shelburne. - Provenance: Bowood, home of the Earls of Shelburne.